Over the years, office building designs have evolved beyond their utilitarian roots to combine both functionality and aesthetic appeal. More recently, architectural trends have turned their focus towards creating healthier spaces that better support the wellbeing of tenants – and tensile membrane facades can help. With tensile membrane facades, architects and designers can strike an ideal balance between overcoming challenges related to energy efficiency and embracing the benefits of natural light – creating the ultimate modern workplace. According to Gallup’s State of the American Workplace report, more than half of today’s workers say that better overall wellbeing is “very important.” And, an increasing number of studies are being conducted on the relationship between human wellbeing and exposure to natural sunlight. A Cornell University study discovered that optimal natural light exposure for office workers can result in an 84% drop in eyestrain, headaches, and blurred vision symptoms; a 10% decrease in drowsiness; and a 2% increase in productivity. A poll of 1,614 North American employees by Future Workplace, an HR advisory firm, found that 47% of respondents admit to feeling tired or very tired as a result of a lack of natural light and that 43% report feeling gloomy for the same reason. A study conducted at the Lighting Research Center (LRC) at Rensselaer Polytechnic Institute reports a direct correlation between daylight, improved sleep patterns, and lower levels of depression and stress. Here’s the takeaway. 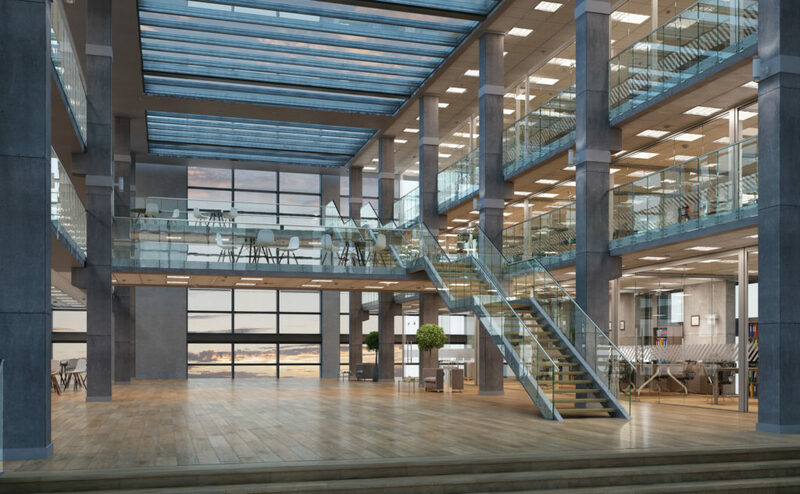 More business owners will be searching for office spaces with access to generous daylight. So, when the goal is to create a modern workplace, architects need to consider the relationship between natural light and their designs. Whether you’re working on a new construction or renovation project, tensile membrane facades protect tenants’ access to natural light while supporting energy efficiency goals, improving exterior aesthetics, and maximizing interior comfort. Here’s the challenge. As you’ve inevitably experienced, natural sunlight sounds great – until you consider the impact of solar heat gain, glare, and damage/fading to interior assets. So, even when a property was designed with substantial natural light, tenants would often install blinds and window coverings that blocked the light – benefits and all. Tensile membrane facades use innovative PVC or PTFE Fabrics to provide a best-of-both-worlds solution. By wrapping the building’s envelope, heat-inducing rays are blocked but natural diffused light can still pour through. Are Tensile Membrane Facades Right for Your Next Project? Explore the option of tensile membrane facades for your next project. Contact one of our experts today by calling 800-422-6827.